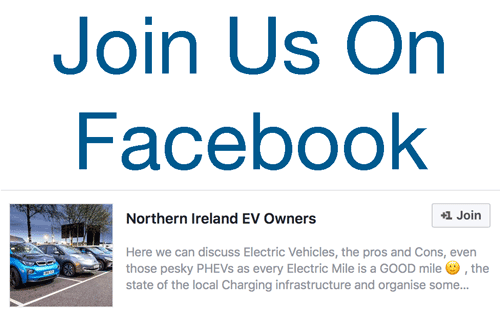 Welcome to the Northern Ireland EV Owners website. PROMOTE – We promote EVs for sustainable transport in Northern Ireland. REPRESENT – We represent our members when meeting stakeholders. ENGAGE – We use social media as a forum for friendly discussion of EVs. IMPROVE – We work to improve the public charger network in Northern Ireland. We will use meetings, member interaction, social media and our website to share practical experiences, helpful advice and friendly support to those driving or considering an EV. We will lobby locally and regionally for growth of an accessible, widespread and reliable charging network. We will strive to influence the development of the rapid charge network as well as encourage public and private organisations to provide destination chargers. We will work with representatives of government and other stakeholders to shape policy that fosters the decarbonisation of our transport infrastructure, switching from Fossil Fuels whilst ensuring the needs of EV drivers are met. Membership is open to anyone with an EV or who is considering one in the future. If you are interested then join in on Facebook or Twitter. We are working towards formalising memberships.